First off, Happy Halloween for all who celebrate it, and don’t forget to take advantage of all the great deals still going on at DriveThruRPG (including the Trick-or-Treat Pumpkin search). Today’s Time After Time Week Pick is part of the Black Hack culture of OSR products. The Time Travel Hack is done by my buddy, Mark Stout, a great guy and clever designer who tinkers and makes cool stuff happen. For a buck, you really cannot go wrong grabbing this and either straight-up playing time travel with your d20s or adding it into your d20-driven games. The Time Travel Hack is a standalone game that lets you play the role of a time traveler. Whether traveling through time and space with a mysterious alien, being part of a team of troubleshooters that go back in time to prevent terrible disasters, hopping through time to stop villains from changing time, or playing police from the future chasing escaped criminals into the past, The Time Travel Hack has it covered. Based on the popular OSR, rules-light game The Black Hack, by David Black, The Time Travel Hack will have you playing in no time at all. Four game themes: Lonely Alien Traveler, Disaster Prevention Team, Time Agents, and Time Police. Simple equipment and weapon rules. Foes ranging from ancient gladiators to futuristic war robots, and suggestions for easy foe creation. 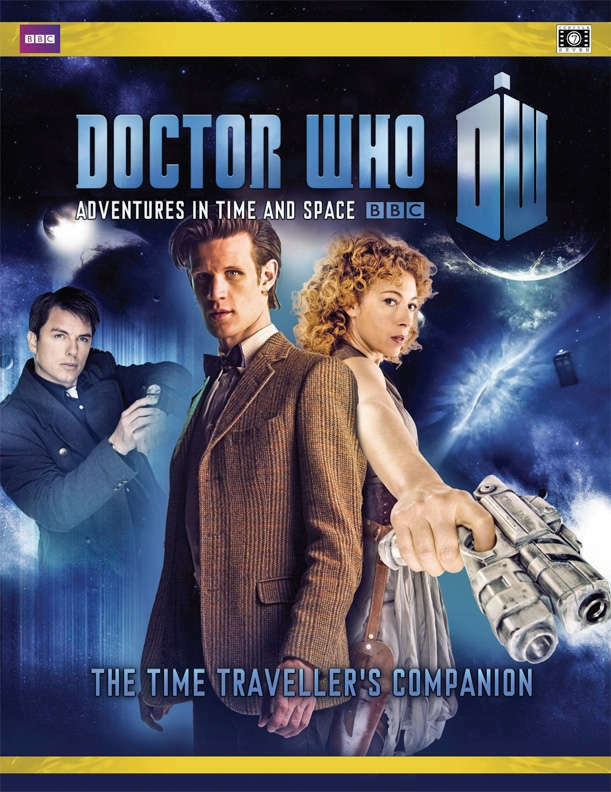 We wander the whole of space and time with a madman and their box, exploring Time After Time Week with Doctor Who: The Time Traveller’s Companion. A book anyone trying to understand the premise of time travel within any aspect of the Doctor Who RPG series will want to have on hand, this is also a great source for anyone playing with time travel within their game. Time flies when you’re having fun, but flying through time can present a whole host of problems. Whether accidentally creating paradoxes, upsetting the course of history or trying to Put Things Right, you’re going to need to know your way around the Vortex. You need a guide…a companion. 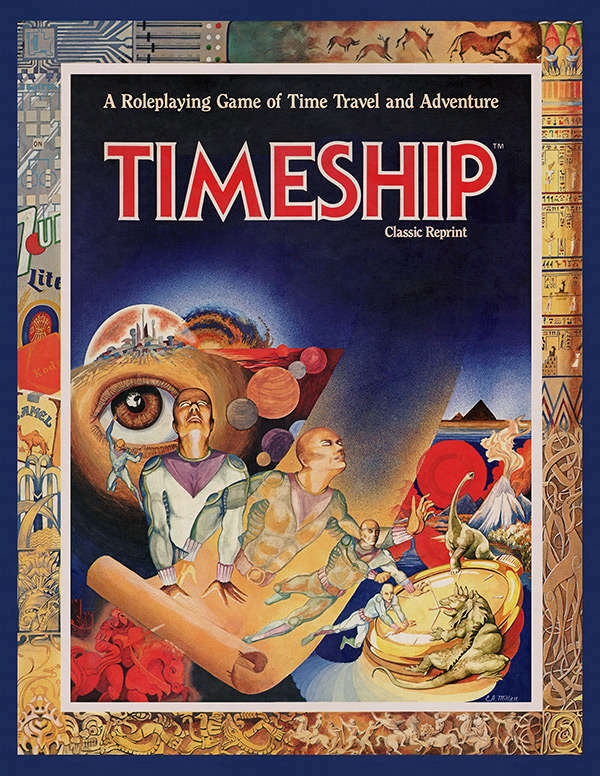 Brett Bernstein‘s request* for me to Pick Herbie Brennan‘s classic Timeship (originally published by Yaquinto Publications, part of the innovative early wargame publisher’s attempt to get into the RPG market) sets off this week’s theme – Time After Time Week. From here, we’ll look at games that deal with the very exciting and challenging idea of roleplaying stories about time travel. Timeship was daring as one of the early games to deal with time travel, and one of its innovations was the concept of both Personal Energy and Group Energy to accomplish important things in the game. The early 80s were not known for narrative, player-facing mechanics, so Bernie gets a lot of credit for breaking some ground here. (*) – Just a reminder that I often make Picks based on someone sending me a suggestion or request (to seanpatfan [at] gmail), and frequently those suggestions become the Theme of the week. Just please remember to choose products that are available on DriveThruRPG. Precis Intermedia brings back this classic roleplaying game of time travel and adventure (originally published by Yaquinto Publications). Murder at the End of Time: The date is August 25, 600,000,000ad and you stand beneath a blazing, unmoving sun. No crime has been committed on Earth for more than three hundred million years; until now! Your mission is to solve the mystery using the bizarre clues and peculiar witnesses. Assassinate the Fuhrer! : On June 7, 1956, World War Three began when the Nazi government of Argentina, led by Adolph Hitler, invaded Brazil. Hitler had escaped capture at the end of World War II and begun the Fourth Reich in South America. It is now April 30, 1945, and you are stalking Hitler through the bunkers beneath a city in flames. Your mission: find him, then make it look like suicide. The Destruction of Gomorrah: It is May 22, 1979bc and you are surrounded by the sights and sounds of the doomed city, Gomorrah, famous for its vice and corruption. You arrived on a simple Time Traveller’s Holiday, but find you must now stop the destruction to save yourself! Timeship is also wide open to creating your own adventures. You are free to roam the ages. Journey from the days of the dinosaurs, to the mystics of the ancient world, to the glory of Napoleon. If the past is not enough, adventure in the present with its political intrigue, and brushfire wars; or, for those more adventurous souls, you may transcend the present and visit the future where man’s home is the universe, populated with all manner of strange and alien beings. The potential for adventure and excitement is only limited by your imagination. Utilize Personal Energy to perform various time-related activities, such as bringing anachronistic equipment to an earlier period or disguising yourself to blend into the period. Utilize Group Energy to open gateways to other time periods or to supplement Personal Energy. Players can portray themselves with a simple system that starts at average ability levels. Then, each player can evaluate himself by improving some and reducing other abilities — his gaming character mirroring both his positive and negative abilities, based on his own judgment. Alternatively, the Personal/Group Energy mechanics can be easily adapted for use with your favorite roleplaying game. NOTE: This is a scanned reprint of the classic 1983 boxed set — a must-have for vintage RPG collectors. We’re closing out Of Swords and Lasers Week with this intriguing setting that directly pits swords against lasers. Amethyst: Quintessence is a world where players choose the path of science and technology or the chaos and wonder of fantasy. This is the 5th Edition version, but there’s also Amethyst material for 4e, Pathfinder, Fate, 13th Age, and more. 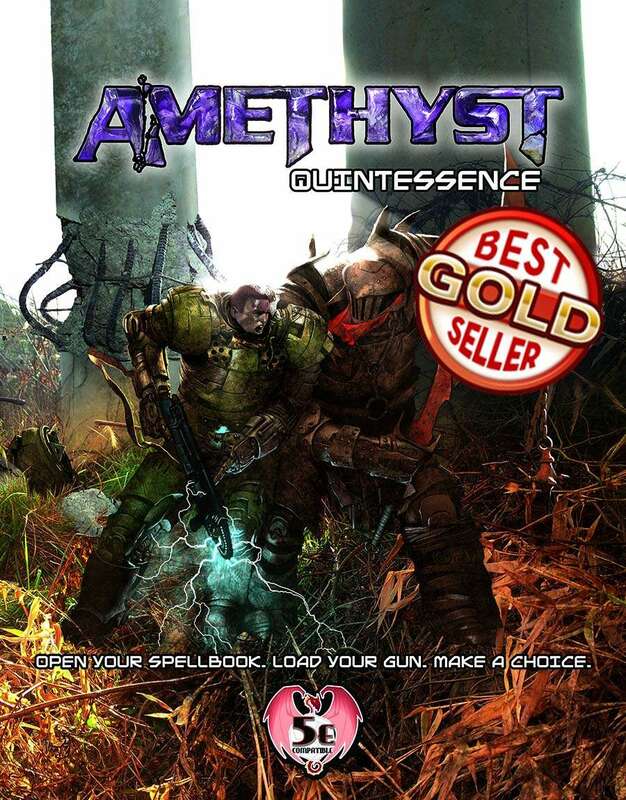 –A new adaptation of Amethyst based on the 5th edition (5E) of the first fantasy roleplaying game, the defining RPG of the last, current, and most likely next generation. 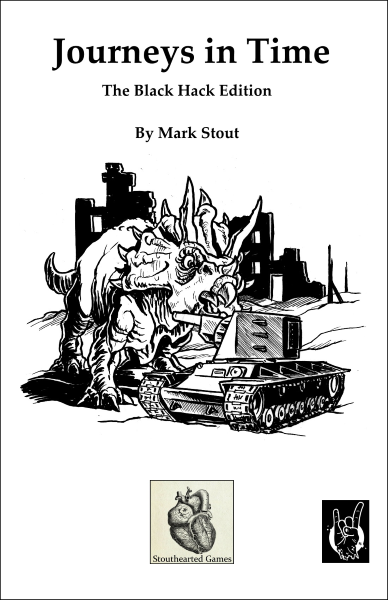 –New technology-based rules including vehicle combat and firearms compatible with any 5E game. –Eleven new races and over thirty new backgrounds. –Eight new classes based around technology. Over thirty new archetypes. –High Tech Equipment from revolves to railcannons. Powered armor. Both ground vehicles and aircraft. 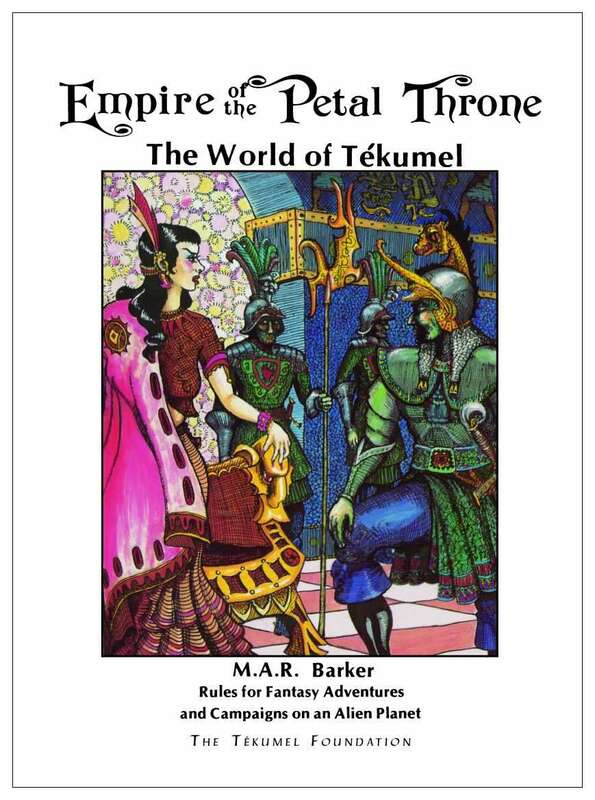 Though not strictly “swords and lasers,” Tekumel: Empire of the Petal Throne still evokes the spirit of Of Swords and Lasers Week with its extraordinary depth the presence of strange technology that lies at the mysterious heart of this long-beloved, highly complex setting. Tekumel was one of the first – and most elaborate – settings ever created for shared storytelling and roleplaying. Professor M.A.R. Barker was very much like Tolkien in his passion for languages, elaborate histories, and all the trappings needed to bring an imaginary world to life. TEKUMEL®: Welcome to a world as complex and fascinating as our own, but unlike anything you have ever experienced. Welcome to Tékumel, the creation of Professor M.A.R. Barker. This is an incredibly detailed science fantasy world, and the basis for the first complete world setting published by TSR Hobbies. Empire of the Petal Throne is a classic of the gaming genre, setting the standard for everything that followed after it. A rich, complex world and a complete set of rules, Empire of the Petal Throne includes rules for character generation, magic, monsters, adventuring, societies and languages. It is set in the 2,354th Year “After the Seal” – the accession of the first Emperor of Tsolyánu, just before the events chronicled in Man of Gold, the first of several novels written by Prof. Barker. Included with the rules is a four page set of charts and tables, errata for the original game, a map of the City of Jakalla, a b&w map of the Five Empires, and a citizenship document for Tsolyanu, the Empire of the Petal Throne! Ack, just realized I totally missed yesterday’s Pick; will make it up by doing a double Pick today (one now, one a bit later on). 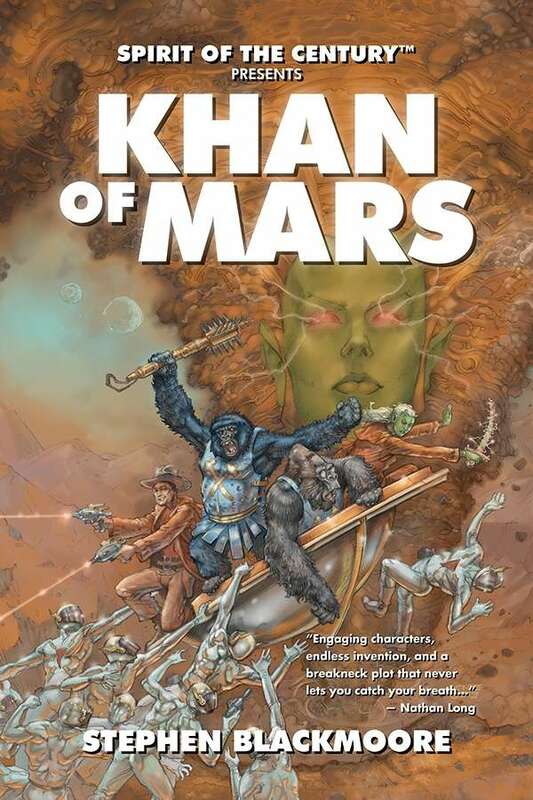 Let’s continue with Of Swords and Lasers Week with this gem from the Spirit of the Century Fate series from Black Hat – Khan of Mars. Spinning off from the Dinocalypse series for SotC, this adventure takes the pulp heroes to the Red Planet and thrusts them into the very heart of politics and adventure that only Mars can provide. LOST ON THE RED PLANET! A spin-off adventure from the Dinocalypse Trilogy! Of course, it’s impossible to do an Of Swords and Lasers Week without showcasing one of Pinnacle‘s latest masterpieces, The Savage World of Flash Gordon. 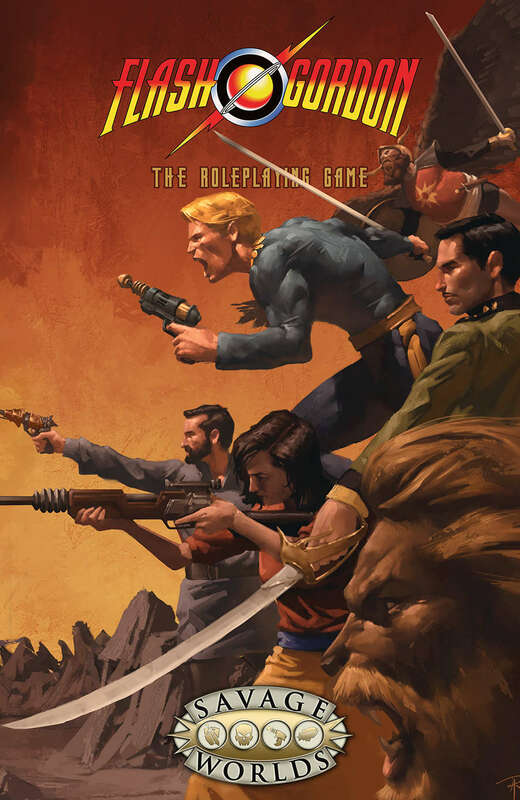 No setting embraces the swashbuckling heroics, the weird science-and-sorcery mix, and the humanity-among-aliens idea more than Flash Gordon, and Scott Woodward deep-dove into all of the source material to make this one of the best expressions of Savage Worlds yet. It’s also a brilliant preview of all you will see in the new Savage Worlds Adventure Edition (SWADE). Also, don’t forget the Halloween Sale going on at DriveThruRPG! More and more, Onyx Path is becoming a house dedicated to much more than the World of Darkness, and this brilliant (and very successfully Kickstarted) celebration of sword-and-planet science-fantasy inspires this week’s Of Swords and Lasers theme. 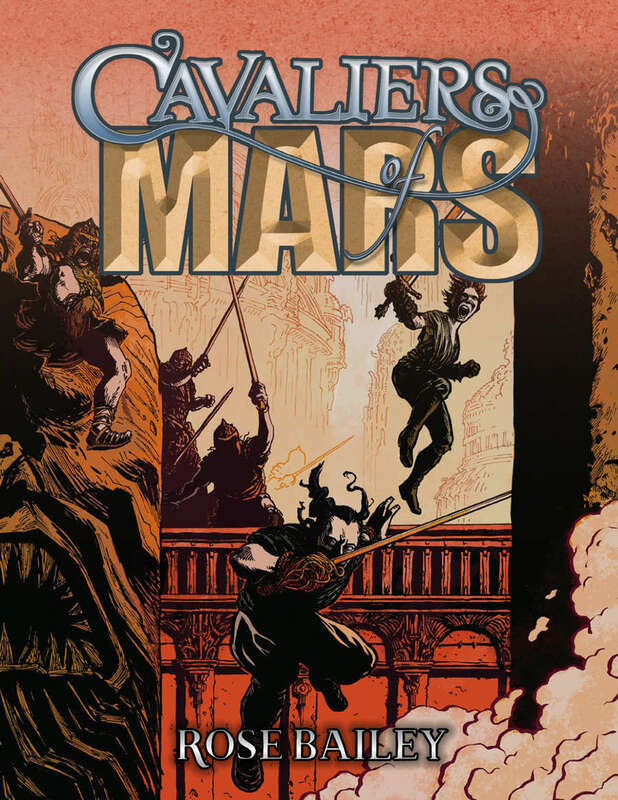 Cavaliers of Mars is a clear homage to Edgar Rice Burroughs’ John Carter, as well as the works of Alex Raymond, Ralph Milne Farley (aka Roger Hoar), Gustave LeRouge, Robert E. Howard, Gardner Fox, and others. Created by Rose Bailey and written by her and an all-star cast, this book hits all of the classic tropes and fun bits while employing modern game design to combine character motivations and swashbuckling action. Also – don’t miss out on the trick-or-treat fun of DriveThruRPG’s Halloween Sale! What if the world changed? Ten years ago, everything did. The world we knew ended with The Event and the appearance of hundreds, thousands of superhuman individuals—ordinary men and women empowered in the blink of an eye, between one breath and the next, transformed or given extraordinary gifts. This is the world of Wearing the Cape – a Fate-driven RPG based on the superhero novel by Marion G. Harmon. Barlow’s Guide to Superhumans is the recently-released first supplement for this well-loved setting. Check out that cover! 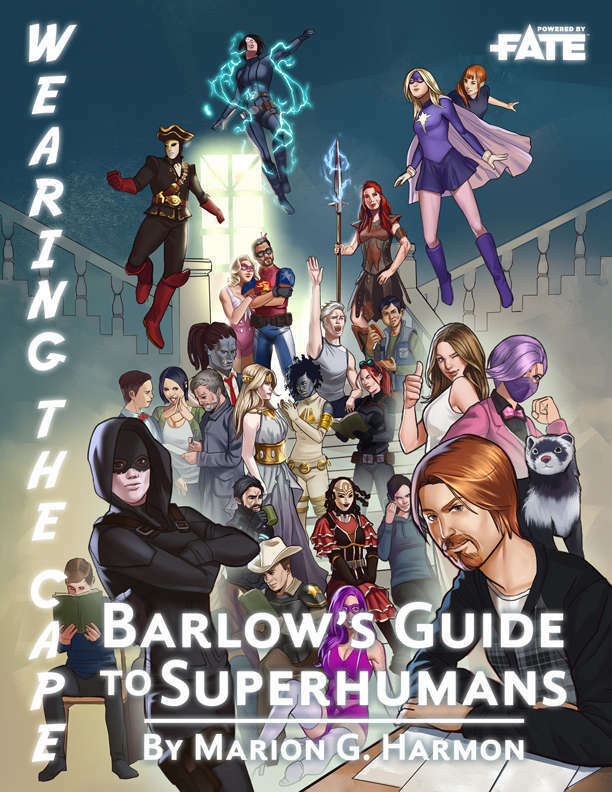 Wearing the Cape: Barlow’s Guide to Superhumans is the first sourcebook for WtC: The Roleplaying Game. It includes: 20 additional pages of pure world background, providing Post-Event history for Europe, Asia, the Middle East, and Africa, with a look at how superhumans wear the cape in different places; 15 additional pages of background covering Post-Event organizations and places; a new rules chapter exploring the uses of Aspects in superhero games (the Aspect Power-System) and a new way of factoring power scale; 120 pages of expanded Power Templates and fully worked up cape-files, including new Power Templates (Dreamweaver-Types and Jumper-Types), more characters from the top-rated supehero series, and dozens of original characters. Today’s Something Happened Week Pick deals with something happening in a town that leaves the kids alone and with superpowers. The premise is set up to make it seem “really cool”… until it’s not anymore. The electricity shuts down, monsters come out, and the kids suddenly have to build forts, band together, and deal with what’s really happening. Another key element that makes Lights Out important is Nightingale Publishing‘s commitment to diverse voices and greater representation within the gaming and storytelling space. This is a game for all kids of all walks of life, and designed so they might all see themselves within its fantastic world. Also, with the Halloween Sale going on until October 31st, this and a lot of other titles can be had for 31% off! No school. No parents. No rules. The children of Applewood woke one morning and discovered that all the adults have disappeared and better yet, they all have superpowers! With no one to tell them to comb their hair or brush their teeth, the kids could do whatever they wanted. All was great until that same night when the electricity shut off and monsters started stalking the streets. Now the children must band together in order to survive the night. Grab your friends, built a clubhouse, thwart bullies and defeat the horrors that go bump in the dark. Do you think you have what it takes to survive in a world without grown-ups? Find out in “Lights Out – The Roleplaying Game” which is based upon the “Lights Out” children chapter series. This game is recommended for kids ages 7 and up with assistance from an adult storyteller, or for ages 10+ without an adult. Build a legacy of gaming with your children. This book contains everything you need in order for you to create endless adventures. It uses 2d6 and a single deck of playing cards for players to share. This book is compatible with “Spooks! Welcome to the Great Beyond” and “Mortal Intrusion”! This game is printed in the OpenDyslexic font for easy reading. Lights Out is dedicated to bringing female central characters to the forefront of every story. Did you know that according to Hanice McCabe who reviewed nearly 6,000 children’s books from 1900-2000 that only 31% had female centric characters? Also, Lights Out wants to ensure that minorities are firmly represented, not only in a positive light, but as strong role models. The NIU review by Melanie Koss in 2012 found that only 21% of children’s books featured a secondary culture. Furthermore, of the 455 sampled works, 75% of human main characters were white, 15% were black and 6% were all other cultures combined. 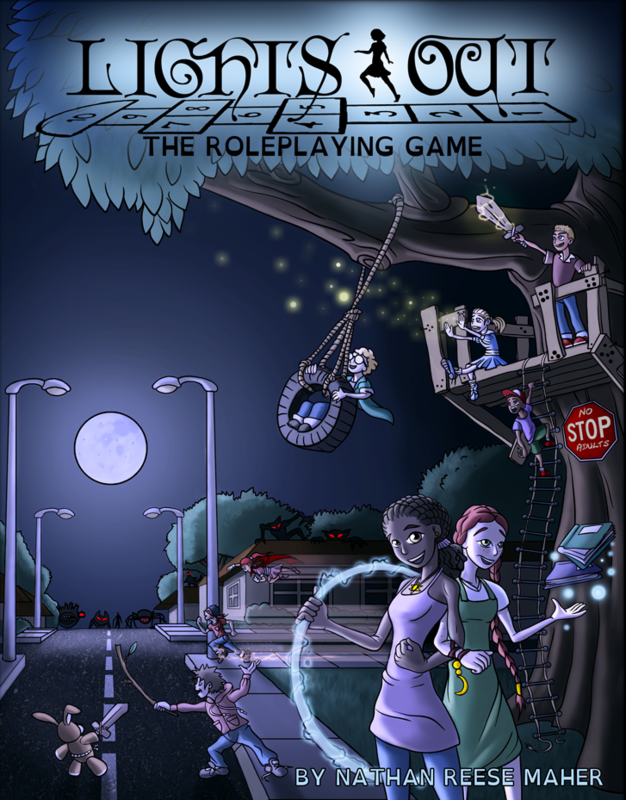 Can “Lights Out – The Roleplaying Game” or the chapter series fix the problems that are currently plaguing our society? Probably not, but it is a step in the right direction.